Posted 2/22/2019 8:35am by Aaron Lichtenberg. The seed orders are in, planting schedules are being put into action, and we are only a couple weeks away from the beginning of the growing season. We've been hard at work analyzing our business, attending workshops & collaborating with other growers this winter. Each year we spend a lot of time within the strong community of local growers & support agencies talking earnestly about our businesses, the eaters we serve, and how we fit in the food system at large. 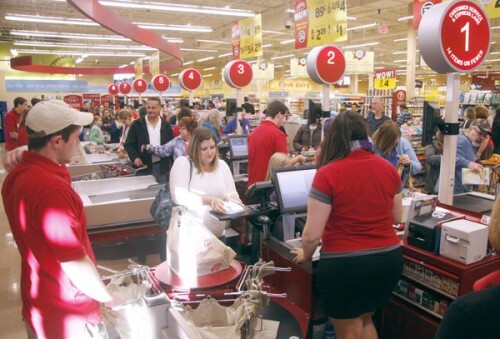 While we know that most folks shop at the grocery store to get most of their food, there are a select few within the community that understand the quality, health, and economic difference of supporting the local farming community, and we can't say enough how much we appreciate that understanding and commitment. 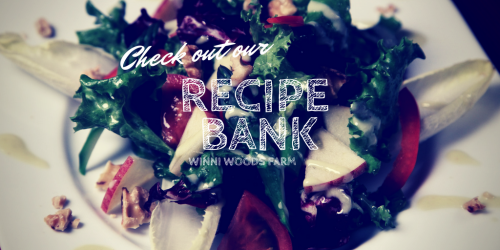 >being adventurous in the kitchen and playing a part in the thriving farm community! 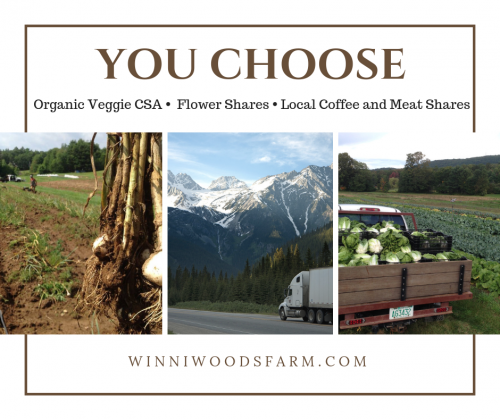 This year we're again offering add-on shares, including Flower Shares, Top of the Hill Farm Meat Shares, and NEW this year Wayfarer Coffee Shares! 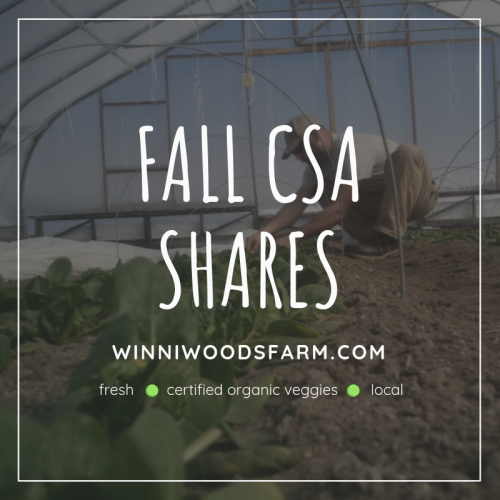 If you haven't joined your fellow community members in CSA yet...go to winniwoodsfarm.com to order your CSA Share, and don't forget to tell a friend or family member and share on the FB! Posted 12/12/2018 8:19am by Aaron Lichtenberg. The weather outside is more than a bit frosty, but the high tunnel is still cranking out some beautiful, sweet spinach for ya's. After a nice start to the harvest morning, hanging at around 60F, a couple hours of of picking ended around 2:30 Pm with frozen fingers as the temperatures quickly plummeted as long shadows were cast by the winter sun falling behind the treeline...the sun dissapears early in these dark December days! We have been out and about this holiday season offering our prepared goods to the local community at different markets and special events. So, if you're looking for a stocking stuffer or last minute gift for a coworker, friend, or family, feel free to get in touch...and you can always order something from our online store. You can also find us at the last Gilford Farmer's Market this Saturday from 9-noon. We're also back again, as a guest vendor, at the Wolfeboro Farmer's Market this Saturday from 10-2pm, or the Wolfeboro Co-op on Sunday from 11-2pm. We are considering more attendance at the Wolfeboro Winter Market a few more times in the new year, so watch out for a newletter letting you know when we'll be there! Butternut Squash Lasagna with a Bechamel Sauce - We have made a version of this for years. It is basically a combination of this and this. In lieu of fresh basil, we brown sage leaves in butter which we lay on the noodles for one layer, and add star anise and rosemary to the sauce as it cooks. Pumpkin (sub butternut squash) Doughnut Muffins - We made these to add to our holiday cookie bags and, while dense and filling, they are still tasty! Posted 12/3/2018 3:48pm by Aaron Lichtenberg. We wanted to share the news of this wonderful event this weekend with all of our mailing list and farm members. It is an excellent opportunity to give the gift of beautiful local artwork at very reasonable prices. I was just at Sarah's studio on Saturday helping set-up and I wanted to purchase one of everything! We will also be there on Saturday to share in the fun, offering samples, and selling our own prepared goods including roasted poblano salsa (including a new hot Mexican-style offering), candied jalepenos, spicy carrot relish, basil walnut pesto, and corn salsa. These all make excellent stocking stuffers or gifts for the foodie in your life! Posted 10/18/2018 9:55am by Aaron Lichtenberg. Two weeks has flown by, as it does always, but much has happened since your last share. Namely, the "official end" to the growing season. We finally got our first killing frost at the farm last weekend on Saturday night. So, we've started the cleanup process in the fields, winding up thousands of feet of dripline, removing trellising, picking up sandbags and tarps, etc. ...with plenty more to do before the snow. Hopefully you've enjoyed the switch in seasons and your Fall CSA Season offerings. As we continue to put up more storage crops for the winter, you'll eventually see more roots in your shares, like beets & carrots, very soon! Have a great couple of weeks and we'll see you at pickup! Posted 9/27/2018 9:59am by Aaron Lichtenberg. We hope that the transition to Fall has been smooth for you and that everyone is settling back into the school routines and dusted off their vests and sweatshirts for these chilly mornings. Although we've arrived at the last summer shares for the season, we're starting up our bi-weekly Fall CSA Share season next week! Aso, this year we're starting what will hopefully be a fun annual tradition with our "compost pumpkin & flower giveaway". 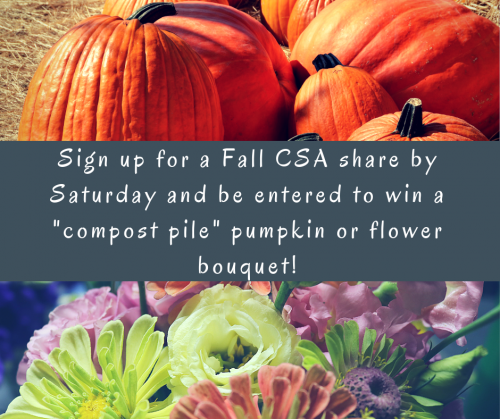 All CSA members signed up by this weekend will be entered to win a free pumpkin or Fall Flower Bouquet, and we'll be drawing a winner for each of our (4) pickup locations! You'll also notice, other than the melons, the transistion in this week's Seasonal Veggie options, which you'll be finding more of in the Fall CSA Shares...although there will be more to come as the winter squash is curing, the onions are drying down and the new planting of spinach is looking great! Lastly, we want to sincerely thank all of our Farm Members that joined with us for the 2018 season. It was another Agri-Rollercoaster, as usual, and we hope you enjoyed the ride! All our best and our big thank you to all our Farm Faithful! Posted 9/13/2018 7:46am by Aaron Lichtenberg. After another long week I've picked up my draft from last week and am trying to keep in touch for week #14...after this week, only two more summer shares left! The SHORT SEASON Shares have ended for the season and only the Full Season 16 wk. shares continue through the end of this month. Posted 8/3/2018 7:01pm by Aaron Lichtenberg. 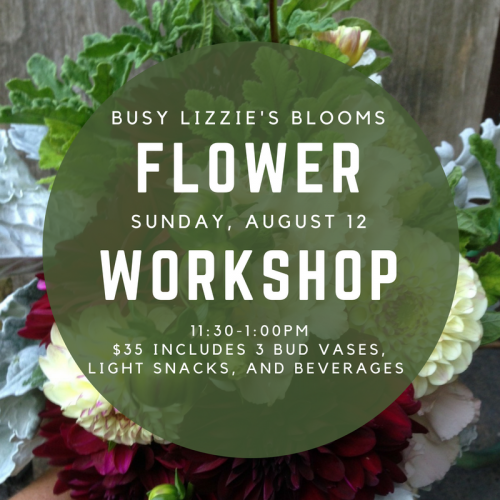 Come join us for fun, laughs, and a whole lot of flowers! We provide the instruction, jars, flowers, ribbon, snacks (including Winni Woods Farm Certified Organic veggies...and some unhealthy stuff too! ), and beverages from Wayfarer Coffee Roasters. All you have to bring is your creativity and be ready to have a good time. Workshop is located at our "Home Farm" in Alton Bay on Sunday, August 12 from 11:30-1:00 pm. The best part is that all Winni Woods Farm CSA members receive a 10% discount at checkout. Enter the coupon code BUSYLIZZIE when you check out. Go to our Farm Store online to reserve your spot.